What do your walls look like? Blank? Sparse? In need of that something special? If so, today’s idea is for you. We have all kinds of art on our walls, everything from professional paintings to a candy bar wrapper. What they all have in common is that they have meaning to our family, which makes them timeless. 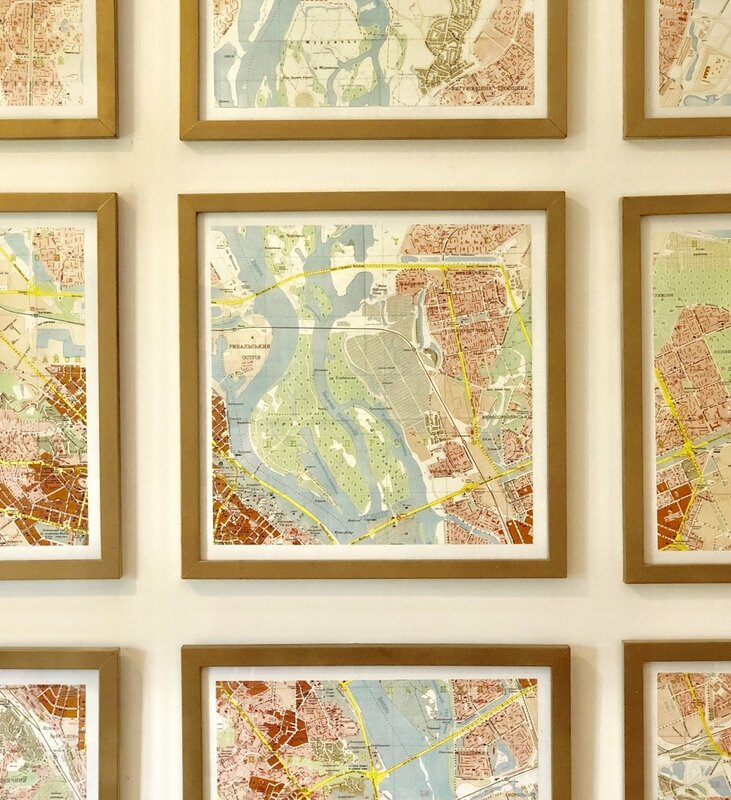 One of our pieces, or actually twelve pieces, is our framed map of Kiev, Ukraine. I love maps! It’s a family thing. My dad and daughter both share my affinity for them. So, it follows that I would put one on our walls. Kiev may not be the obvious choice for most people, but for us, it is perfect! I often see framed maps in catalogues for more than I want to pay. My favorite look is one that turns something that could be very traditional and stately into a much more contemporary and fresh display by employing multiple frames. There are some advantages to this method. 1) If you were to frame a large map in one piece, it would be lovely but also really costly. The glass alone could be a budget buster. Dividing the image into equal pieces with identical frames and hanging them as unit fills an empty wall beautifully but for a manageable price. 2) If your map is two-sided, you can actually use both of them. Read on and I will show you how. 1. Make copies. If you decide to frame both sides of your map, take it to a copy center to have the back duplicated on a series of 11” x 17”'s. It will be a little tricky but don’t worry if things don’t line up perfectly. Overlapping images is better than missing parts. If you discover that the color rendition on the copies of the back is too different from the front, just make copies of the front too. This portion of the map is actually three pieces put together. Once framed, no one notices. 2. When you get home, lay the whole map out. Piece together your new map parts with tape on the back side. 3. Measure the complete image. Divide those measurements by the dimensions of the frames you want to use which will give you the number of frames you need to purchase. I chose 12”x 12” scrapbook/album cover frames. Some I found at a garage sale and the others at the craft store. If you hit it right, you can get them for $5 each. 4. Paint the frames. I wanted mine gold and the originals were black. A can of spray paint did the trick. 5. Cut the map apart to fit the frames. Because my copies were no bigger than 11” wide but my frames were 12”, I decided that having a ½” border all the way around was a good plan, which meant the images were 11” x 11”. 6. Mount the map pieces onto scrapbooking cardstock. Use a good scrapbooking glue or try some spray adhesive. 7. Cut foam board to fit the frames. Since you are framing copies, there’s no need to go to the expense of doing everything acid-free. Just get your boards at Dollar Tree. 8. Clean the glass and remove all lint from the surface. By the way, if this art installation will be going in a high traffic area or where kids will be, well, kids, you may want to consider something. I have these same frames in my son’s room. They have been knocked off the wall and the very thin glass has of course gotten broken. So, I have been replacing them with plexi-glass which I get cut at Lowes. 9. Make a “sandwich” with the glass, art, and backing and insert into the frame. Number the backs of the pictures so you don’t forget what goes where. 10. When you hang the finished pictures, consider using Command Velcro Strips. They aren’t cheap. But if you hang each picture on a nail then stabilize it with even one strip, it will save you the frustration of constantly straightening the collection every time someone walks past. There you have it- a budget-friendly installation that makes a visual statement while telling part of your story.